After an exceptionally exciting Day 2 that ended with the National Air and Space Museum, the 6th grade boys woke early this morning to begin their third and final day in the Nation's Capital. After sports on the Mall this morning, the boys made their way to The American History Museum to specifically view and experience the Star Spangled Banner, Gunboat Philadelphia and the American Presidency. As I write this entry they are enjoying lunch together at the Stars and Stripes Cafe. Only in Washington! After visiting Congressman Steve Israel of Long Island, (2nd Congressional District) New York, earlier in the day, the boys, pictured here in the halls of Congress, are unexpectedly invited to witness a vote on the floor of the House. Very exciting! Day 1 for the 6th Grade ended with journals at their hotel, reflecting on the day, recording thoughts, observations, and experiences. Pictured at left is one of the last monuments the boys saw on their tour last night, Iwo Jima, and at bottom, a journaling shot. Day 2 saw the boys rise early to tour The White House. As you can see, it is a beautiful spring morning and the boys are eager to enter. Following their White House tour, the boys moved on to The Capitol Building where they met the Chairman of the House Armed Services Committee, Congressman McKeon of California. They then entered the Capitol for a tour. After a walk around the Reflecting Pool, the boys made their way to the National Air and Space Museum of the Smithsonian. The boys are currently enjoying an up close and personal look at the new MLK, Jr. Monument at a stop on their Trolley Tour of the Monuments of Washington. It's a beautiful night to enjoy the tour. Located at 1964 Independence Avenue, S.W., the address on the National Mall commemorates the year that the Civil Rights Act of 1964 became law. The Class of 2014 arrived safely by motor coach in DC this afternoon, on schedule, at around 1PM. After depositing luggage at their hotel, they immediately headed off to visit the Library of Congress where they viewed specifically two bibles--the Gutenberg and the Mainz--both crafted in the same German town in the mid 1400s; examined early perspectives of the Americas through original maps of early explorers; carefully reviewed the nation's founding documents: The Declaration of Independence, The US Constitution, and The Bill of Rights, and then left for the Supreme Court and a special tour and lecture. In a report from the field earlier this afternoon, the teachers noted that the boys were recognized for asking really thoughtful questions of the Supreme Court presenters. Later this afternoon, the boys will check into their hotel, get their room assignments and then head out to sports on the Mall. After enjoying dinner together, they will embark on a private trolley tour of the Monuments of Washington this evening. The boys will be focusing on Lincoln, Washington, Jefferson and the new MLK monument to name a few. The trip to Washington marks the culminating experience of a comprehensive study of the founding of the Republic, its system of government, and the desire of the school to have the boys experience first hand, after extensive study, "the world up close." Pictured here is author Dennis Smith, today in the Hume Library, addressing the 8th Grade boys on his newest book: Decade of Hope: Stories of Grief and Endurance from 9/11 Families. Mr. Smith shared his experiences that day as a NYC Firefighter responding to the WTC site and the days and weeks of work that followed for the first responders. He also shared with us personal anecdotes from his interviews with the wide range of people featured in Decade of Hope, his fourteenth book. A highly engaging and poignant speaker, Mr. Smith drew the boys into his narrative through graphic detail and the exploration of powerful human emotions--anger, fear, and most importantly love and hope. A New York Times Best Selling author, Dennis also recalled his youth growing up in a very different New York, and his love and passion for writing that came to him later in life. Mr. Smith served in the Air Force, then the FDNY, and more recently as entrepreneur, philanthropist and active supporter of First Responders. Dennis shared his writing process with the boys and the value of finding/creating a life well-lived. He challenged them to find their place in the world by pursuing their passion and finding a way to capture it in "their story." "We all have a story to tell," he told the boys. I was moved, as were the boys, by Dennis' unique mix of the pragmatism of daily life and the intellectual and spiritual dimensions of "a full life," and his underlying message of the importance of rigorous pursuit of knowledge and deeper understanding--to analyze and reflect--and not to blindly accept what appears to be. Mr. Smith is one of several authors visiting the school this spring to meet with the boys at various grade levels--a Visiting Author program sponsored and supported by our Parents Association. Tonight we spent a fascinating evening inside Gracie Mansion. I am not sure we could have had more beautiful spring weather. Hosted by the Conservancy and sponsored by our Alumni Parents Council, the event was the 5th in a series of social/cultural gatherings aimed at building the links between our current and extended Saint David's School community. Previously, we have held this annual gathering at the Metropolitan Museum of Art for a special viewing of the then new "East Asia Exhibit," The New-York Historical Society for a behind the scenes look at “Grant and Lee,” The Park Avenue Armory’s “Veteran’s Room” with an up-close critique of the architecture of the Room and the City through the eyes of Stanford White, and last year, the George F. Baker Houses. Docents took guests for tours of the mansion throughout the evening. One of the most interesting artifacts I came across was this 12 pound cannonball sitting on the mantle in the main parlor. It's a British cannonball fired on what was then known as the Walton house. The house at the time was occupied by Washington's troops as a headquarters and gun battery for the "American Colonials" protecting the north east section of the island where the East River and Hells Gate join. The British, encamped in Queens just across the East River, bombarded the house in September of 1776. The Walton House was completely destroyed. 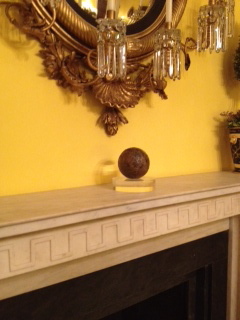 This solid iron cannonball was excavated from the property during the 1980 restoration of Gracie Mansion. It was after the war that Gracie purchased the property and built his country house, which at the time was some 5 miles outside "New York City." The evening, attended by some 190 alum parents, alums, faculty and staff, was enjoyed by all. This summer, Saint David's is partnering with The Martin Institute For Teaching Excellence out of Memphis, Tennessee to provide a Master Class for teachers here at the school. The class, which will draw teachers from all over the tri-state area, will be led by John Hunter for several days in July. 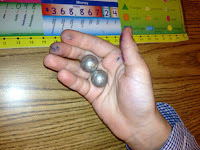 John Hunter, the creator of the World Peace Game is an experienced teacher who has, over time, designed a unique and highly interactive method of instruction. He has a way of reaching teachers deeply as they reflect upon and reconsider their teaching practice. Saint David's is pleased to be hosting this exciting professional development opportunity. Below is a short TED talk from last year about John's work. There is also a feature length movie soon to be released. One of the things I enjoy the most about what we are doing at Saint David's is thinking outside the box. The classroom can sometimes be a box. It is true that often our access to virtual technology tools allow us to go beyond the walls of the classroom in a virtual sense, and we do do that often at Saint David's. The danger in today's world, however, is that we can believe that this experience is equivalent to the real thing. It isn't. A satisfactory substitute at best, the virtual can never fully replace the real. I was reminded of this in Rome and Florence recently traveling with the 8th grade. Standing in front of an ancient artifact, a Renaissance sculpture, or a Medieval painting, and letting it speak to you, surrounded by its cultural context is a remarkable, real experience--that's why we take the boys to Rome, Assisi and Florence as a culminating learning experience after a year of intense study in the art and history of the Renaissance. It's also why we now take rising 8th graders to Salamanca, Spain for total language and cultural immersion, and its why we take 7th graders to Cape Cod, and the 6th graders to Washington, DC and it's why we have newly partnered with the New York Historical Society to develop a unit of study centered around the 2nd grade's study of the American Revolution and the founding of the nation. 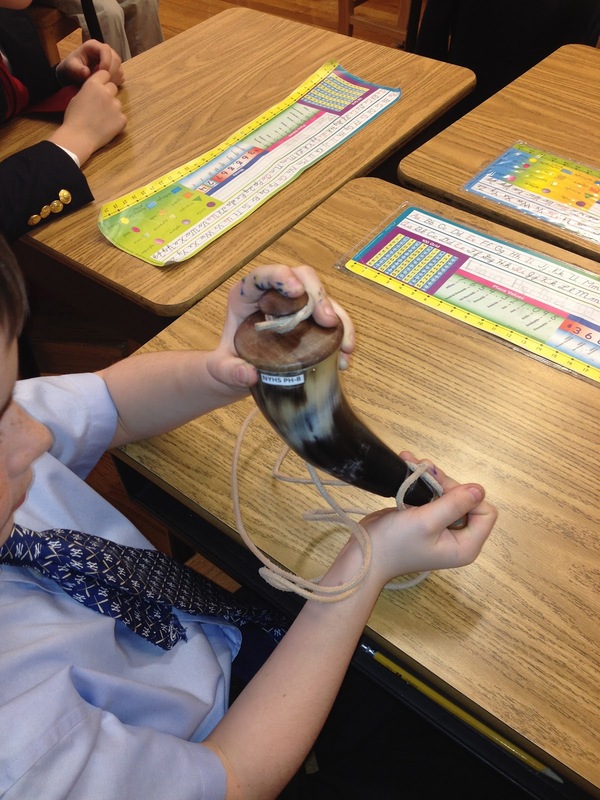 After a significant amount of planning, a teaching artist from the New York Historical Society will be working in collaboration with our teachers and the 2nd Grade boys to enrich the boys' understanding of this time period. 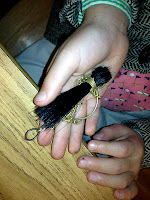 Today, I joined some 2nd graders as they touched and critically observed and examined artifacts from the era, including a Powder Horn, Musket Balls and a Horse Hair Brush and Pick (all pictured herein in the hands of inquisitive, excited 2nd graders). They had a thousand questions for the expert. In the coming sessions of this new collaboration, utilizing the expertise and resources of the Society, the boys will come to learn and understand how printmaking allowed information to be more easily distributed and disseminated, and how it contributed to the development of the new nation. They will also create symbols and images of the Revolution, including the creation of their own "Kerchiefs." In this case it wasn't possible to go there--to escape the box--so they came here. Either way, its more real!